Yet another reason to leave your heart  in San Francisco — recent rankings  show that the City by the Bay is the nation’s best place to trick-or-treat. So for those of you done with midterms (as if they ever end), there’s no reason not to head into SF Monday night. Who cares if you’re a 20-year-old running around in a Scooby Doo  outfit? The sugar makes it worth it. 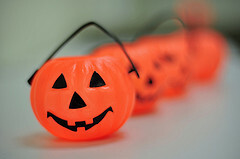 Apparently, the rankings used three main criteria to determine trick-or-treat standings: the walkability of the city, the population density and the median home value. San Francisco ranked first on all three, beating heavyweights such as last year’s number one, Seattle. Walkability: Even though San Francisco is known for its steep uphill climbs , the city nevertheless scored a walk score (we have no idea how this was calculated, don’t ask us) of 84.9 out of a scale of 100, beating out second-place Boston by a margin of nearly six points. The walkability of a city is essential — after all, it can get quite stuffy in your Hagrid outfit , and being able to get around comfortably becomes important when lugging around cauldrons of candy. Population density: San Francisco blew everyone out of the water on this one — Fog City placed first with 17,169 people per square mile, while second-place Boston doesn’t even come close with 12,787. From what we understand, the more people there are, the more opportunity there is to nab extra goodies. Always a plus. Median home value: What’s the point of taking a BART trip over if all you’re gonna get is crappy candy ? That’s the reason why median home value is evaluated — the thinking goes that the wealthier the people, the more king size  you can get. SF takes this category with a median home value of $660,494 (winning by more than $100,000 over runner-up Honolulu). Naturally, you wouldn’t know how accurate these rankings are unless you were to check out the trick-or-treating scene yourself! If you do end up going, feel free to take lots of pictures, hoard pumpkins full of candy and donate some of your goodies to the Clog. We could always use something to satiate our sweet tooths. Now is the time to unleash the child in you . Happy Halloween!